Product #505 | SKU Z-DSA | 0.0 (no ratings yet) Thanks for your rating! The Zacuto Single Action is a set of mini-rails and baseplate that attach to your tripod and allow for easy mounting of your video DSLR. In conjunction with the included Z-Focus, two universal Zipgears are cut to size to give you smooth, precise follow-focus ability over two lenses, while a quick-release plate lets you easily switch the camera between tripod and handheld use. 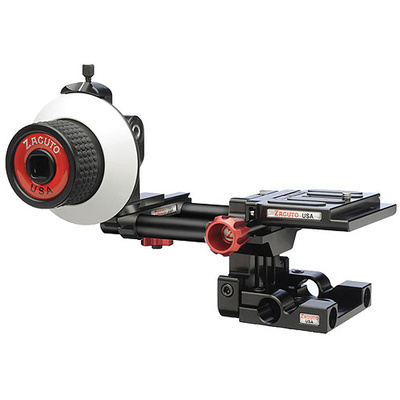 The Single Action can also be upgraded for use on a shoulder rig. Additional Zipgears required for additional lenses. Works on any DSLR camera with or without battery grips, as it is infinitely adjustable in height. Camera can also be quickly released from the rig by turning the red knob then pulling up on your camera. Quick release plate stays mounted to your camera so you can quickly switch between using the camera as part of a rig or on its own. 0.8 pitch Zipgear Universal fits one lens by cutting the strand to fit your lens and connecting the strand together.